Unless you count a glorified garden centre, or a few nice information posts along the quayside, Newhaven has only one decent tourist attraction. On the top of the cliffs overlooking the mouth of the river. A Victorian fort. 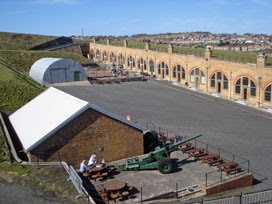 Newhaven Fort: Most ancient monuments are more than 140 years old. But this defensive structure was completed only in 1871, at the behest of Lord Palmerston, in readiness for a French invasion that never came. It's well placed for a gun battery. Sheer chalk faces the water on two sides, while deep trenches defend against invasion from inland. 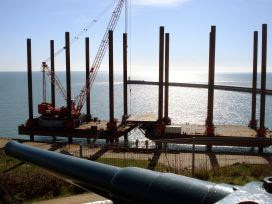 But its timing was poor, built only a few years before the deployment of metal-hulled warships, and made entirely redundant by the advent of aerial bombardment in World War One. The Army kept it on as a training barracks until the 1960s when it was sold off to the local council. They passed it on to a private developer with plans for a holiday village, who promptly demolished most of the interior and went bust. A few years later the council tried again, teaming up to create an ambitious leisure destination called Fort Newhaven, but that collapsed too. So now it's run as a military heritage attraction - understated but realistically pitched. And, more than I initially expected, well worth seeing. 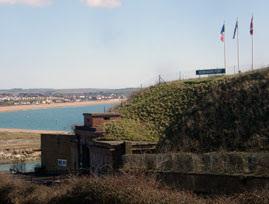 Head south out of Newhaven, past the "last public toilets before France", and the fort's up the top of a hill. Entrance is via the main drawbridge (it'd have to be via a rope otherwise), then past the nice lady at the turnstile in the gift shop. Rest assured that the interior's far more than a shell - the last round of private renovations saw to that. Along one side are fifteen 'casemates', which may look like railway arches but were where the officers used to sleep. Each has an exhibit or display inside, ranging from how the place was constructed to the failed WW2 invasion of Dieppe. I've heard the D-Day story many times before, but it hit home much better with a local connection. A filmshow explains the history of the fort, less amateurishly than usual, while another contains eerie Cold War memorabilia from a nuclear watch station. There's even an air raid simulation on the hour, every hour, which is exactly like the real thing except shorter, 100% safe and you don't emerge to find your house destroyed. Along the eastern perimeter is a similar multi-room display based on World War I. The presentation's not especially modern, no touchscreens or interactive videos, but there are buttons to press throughout for a variety of well chosen soundscapes. The right side of educational, I thought. Round the back, dug into the cliffs, is the Eastern Magazine where explosives and shells were stored. There are plenty of whitewashed rooms to explore, lit and unlit, as well as a terribly narrow 'lighting passage' descending all the way along the back. For fitter visitors a 70-step staircase leads down to the ground level Caponier - that's a brick-built protrusion on the foreshore with several small windows for firing at passing ships. The lower tunnel's a little spooky, and yet somehow Yvette never brought the Most Haunted team here. But it's more fun to climb the ramparts. A series of steep grassy banks lead up from the parade ground, first to a series of tunnels and chambers carved into the hillside. Even though you're not the first explorer around these parts there's still a feeling of discovery as you poke along each passageway, ascend crumbling staircases and emerge back into daylight somewhere else. 'Children must be supervised by an adult at all times', say the signs, but only because of a healthy lack of safety barriers around the edge of a variety of slippery slopes and gun emplacements.